With winter officially gone and spring in the air, we’ve been enjoying some spring process art. 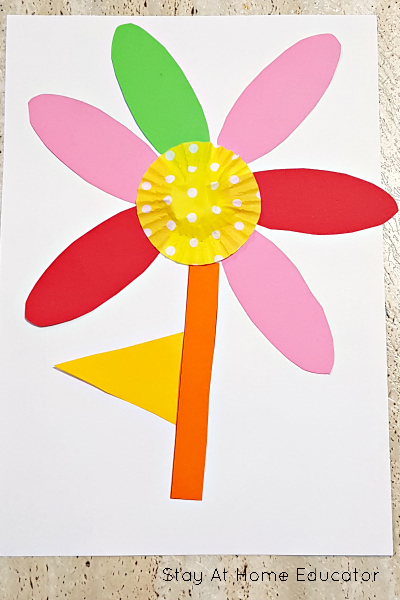 This shape flower invitation to create does double duty by teaching preschoolers about shapes in addition to developing problem-solving skills and encouraging creativity. Collages have been a huge focus of the crafts in our house lately. My 4-year-old has been doing them at Kindy and can’t wait to come home with all of her creations! This had led to us setting up a cutting and gluing station at home. Yes. You read that correctly. A cutting and gluing station. 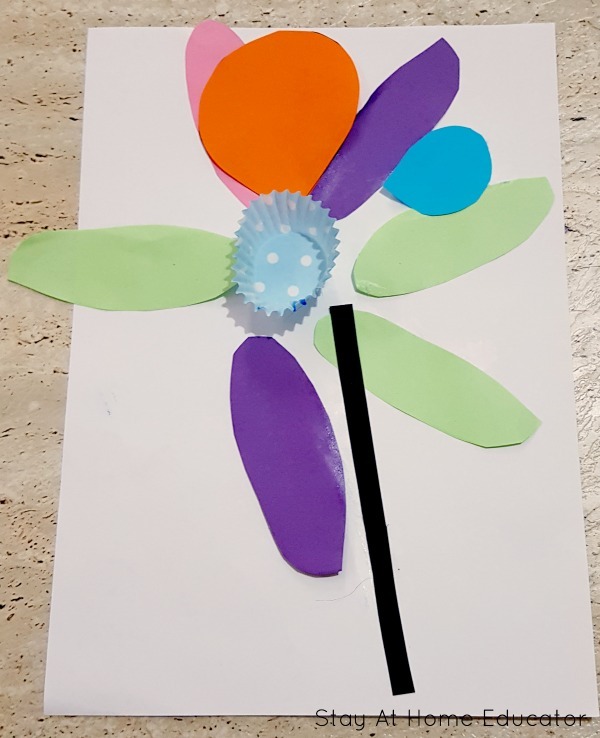 With spring in the air, we thought we would attempt a shape flower invitation to create. 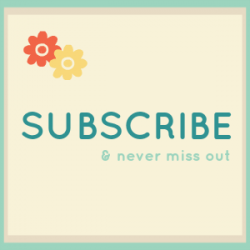 One of the reasons I love invitations to create is that there is a lot of room for creativity. While we have a basic theme in mind (this one was flowers) you will often find that the children will make something completely different! Don’t be surprised if you end up with a robot or a truck instead! This spring process art doesn’t take much prep work or many supplies, but the outcome is so lovely. 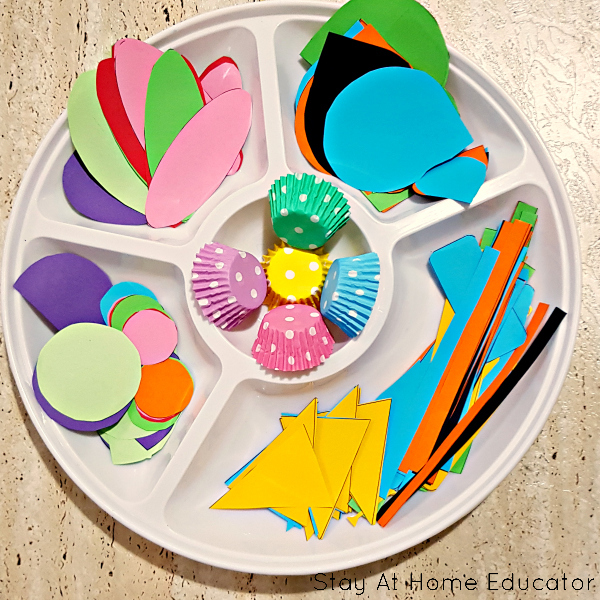 It’s a little spring, a little science, and a lot of practice in shapes! Before we started our collage activity we read some of our favorite spring books and went for a walk around our local park observing all of the different flowers. We discussed the colors, the shapes of the leaves and the petals, the textures and the size of the different flowers that we observed. We also took a few photos to refer to when we were doing our activity. This helped us integrate some science, too! Instead of having a sample flower collage for the children to be inspired by, we used the photos instead. I then sat down with them as we were doing the activity and made my own, working beside them rather than offering instructions. 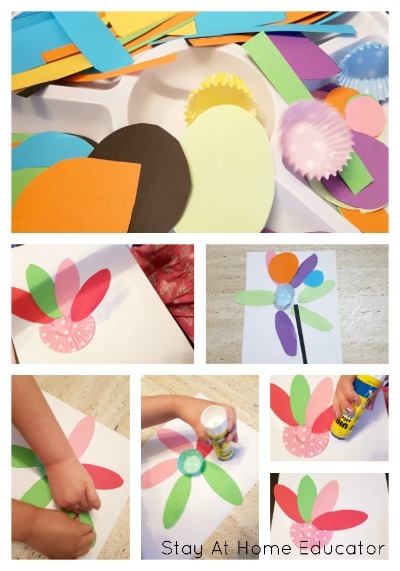 I like this method as it gives them ideas on how to get started (some children struggle with this) without telling them that their flowers must look like mine. You’ll see how different they all looked at the end! But most importantly, it’s the perfect combination of process arts and crafts! 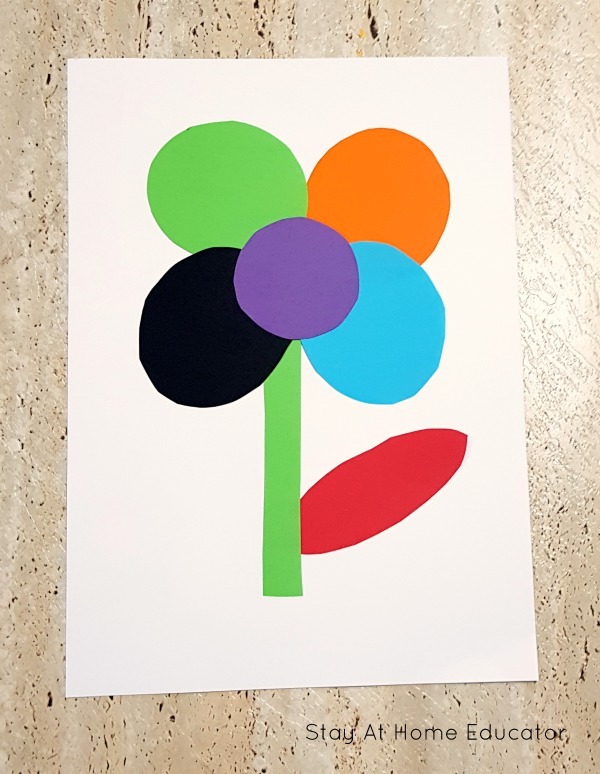 Print out the shape printable onto different colored pieces of paper. Cut out the shapes (I did the cutting for this activity as there’s quite a lot, but the children could do it themselves if they prefer). To save time you can cut a few sheets at once. Don’t forget to put out your flower photos if you decided to take some (or look some up on the computer for discussion and inspiration). I love that the finished flowers are all different. There’s no right or wrong way to create these and yours will look different to the ones that we created. 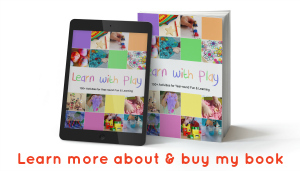 This is a great activity for a multi-age group too (perfect for us, as my 6-year-old was on school holiday when we made these so she was able to join in too). My kids enjoyed being able to pick and choose which colors they wanted to use and what shapes. They worked on gluing and pasting as well as planning! I think that was the most difficult part was the children planning out in advance what they wanted to do, but what a great lesson in problem solving! 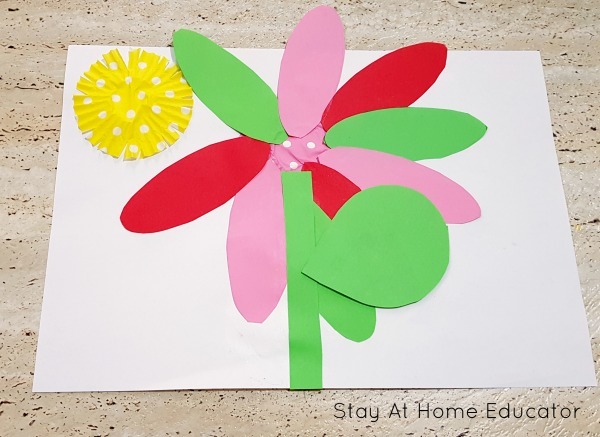 You can do this as part of your spring theme, include it in your shape activities in math, or just for the sake of creating! 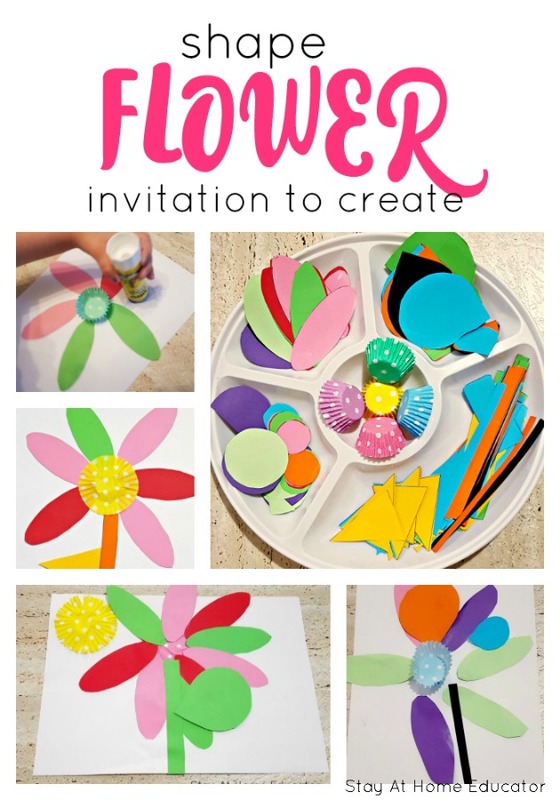 I hope your children enjoy the shape flower invitation to create just as much as mine did! Since taking the above photos they’ve already asked me to print out more shapes and are onto their second lot of pictures. 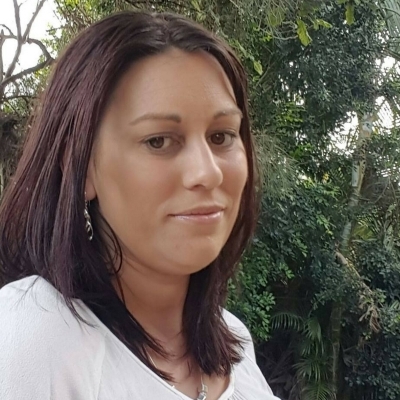 I’m Carol, an Australian Teacher and the Mum of 2 toddlers who have LOTS of energy. I spend my days finding simple and fun activities to keep them both busy and love sharing our crafts and activities with you. 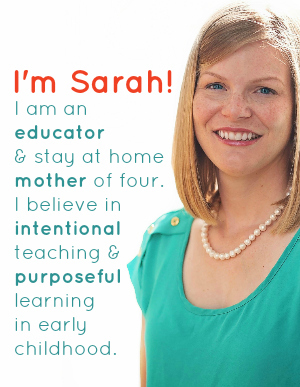 I believe that toddler activities don’t have to be expensive, and that simple activities can provide great learning opportunities for young minds.